Lehman Brothers is synonymous with financial catastrophe, but one entrepreneur hopes the brand will make him a fortune -- as a range of Scotch whiskey. 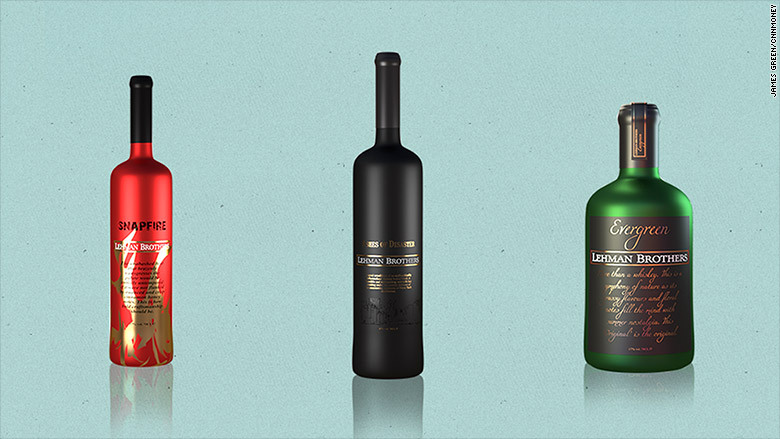 James Green, 34, is launching three whiskies with Lehman Brothers on the label. The most popular of the range, "Ashes of Disaster," claims to have a "wicked suggestion of burning banknotes, a hint of ripe autumn fruit about to fall." Lehman Brothers collapsed in the largest U.S. bankruptcy in history in September 2008, sparking the global financial crisis. A British real estate investor, Green filed in 2013 with the U.S. Patent and Trademark Office to use the term "Lehman Brothers" for bars and spirits. He says he's now taking online orders for the whiskey from bar chains in London and New York. Barclays Bank (BCS), which bought parts of Lehman Brothers, filed in 2014 to stop Green using the name. It noted, among other arguments, that the investment bank often gave "cut crystal whiskey decanter[s] etched with the mark Lehman Brothers" as gifts, which means its trademark should extend beyond banking. The filings show Barclays suspended its case in October 2015. Green told CNNMoney an outcome of the dispute is "pending" so his lawyers have told him to sell as much whiskey as he can. "It's full speed ahead," said Green, who expects bartenders on both sides of the Atlantic to be pouring the whiskey within months. Another of Green's Lehman whiskies is his spicy American-made "Snapfire," which he suggests is "perfect with reckless maneuvers, long gambles, and explosive consequences. Drink alone, if possible." Green is now looking for investors to help him open Lehman Brothers themed bars, including one on Wall Street. It would perhaps be the perfect place to sell the third whiskey in the range, called "Evergreen." It is being marketed as "perfect for when fortune is with you and you are riding your luck. Tastes best when you are sitting on top of the world."